I’m a gamer. I’m pretty sure everyone who knows me realizes that. My frequent gaming related posts here should give some clue, I suppose. As a gamer, I’ve seen all kinds of gaming things I’ve wanted – consoles, PC upgrades, arcade machines, and more. Nothing I can recall, though, has ever appealed to the gamer geeky gadget gotta-get guy like this LCD-playboard based UltraPin pinball machine the Retro-things folks saw at Pinball Expo in Chicago. One interesting development at the show is UltraPin by Global VR. From a distance, this 250 lb machine resembles a machine from the past. When you get closer, you realize that the play field is actually a 32-inch 16:9 flat monitor, and the traditional dot matrix scoring screen on the back glass has been augmented by a second monitor. To keep the experience as real as possible, UltraPin features a force feedback system that allows you to bump (and tilt) the machine in a quest for a high-score. The machine actually comes with 6 emulated classic tables, with additional table 6-packs for post-sales add-ons. Naturally, it comes with a real downside (as darn near every ultra-cool thing in the world does) – this puppy costs $6500. 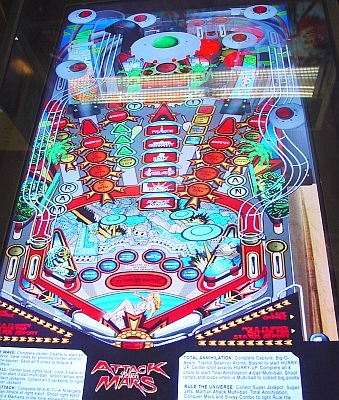 That, and apparently the pinball graphic does not reflect the surrounding virtual table.